Karma Network | FCFL's Sohrob Farudi: "The entire game is designed and built for interactive digital fans"
FCFL's Sohrob Farudi: "The entire game is designed and built for interactive digital fans"
Football is by far America’s favorite sport, and it’s statistically been the spectator sport of choice since 1972, according to Gallup. The most-watched television programs in history are invariably Super Bowls of various years. The NFL’s revenue‚ which comes from broadcast rights, ticket sales, merchandising and licensing rights, is currently close to $15 billion — a figure that League Commissioner Roger Goodell has targeted to grow to $25 billion by 2027. Off the pitch, sports fandom knows virtually no bounds. Fantasy football leagues turn the NFL from a part-time entertainment vehicle into a year-round compulsion on mobile devices, while teams leverage social media to engage fans across many platforms. Sohrob Farudi is the CEO and lifelong football fanatic behind another new league, the Fan Controlled Football League (FCFL). Unlike many other existing leagues, however, his comes with a twist: The fans control every aspect of the game, from naming the team and drafting the players to deciding the actual plays called by the quarterback on the field. After a proof of concept season in Salt Lake City last year, the FCFL is currently in the final stages of preparation for its first full season in its home base of Las Vegas. The league has already signed a two-year deal with gamer-focused streaming site Twitch and onboarded NFL stars Chad “Ochocinco” Johnson, Marshawn Lynch, and Richard Sherman, as well as Latin rap superstar Prince Royce, as team owners. 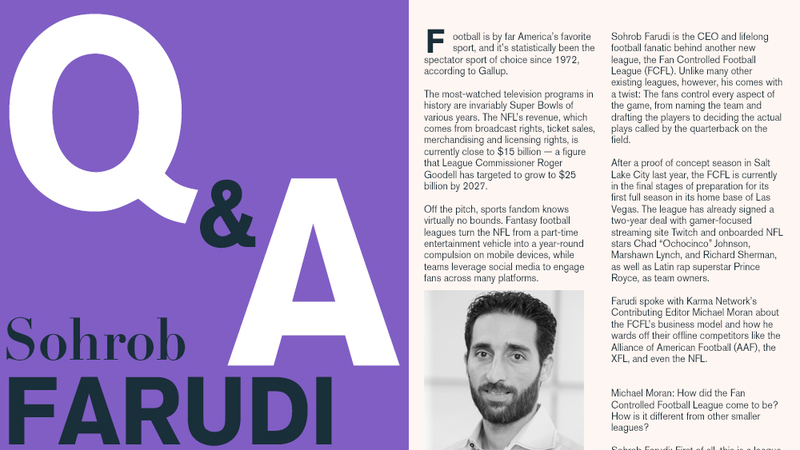 Farudi spoke with Karma Network’s Contributing Editor Michael Moran about the FCFL’s business model and how he wards off their offline competitors like the Alliance of American Football (AAF), the XFL, and even the NFL. Michael Moran: How did the Fan Controlled Football League come to be? How is it different from other smaller leagues? Sohrob Farudi: First of all, this is a league designed for the digital fan, so we're not at all concerned about butts in seats. We're not even going to sell tickets to the game. We're playing the games in a production studio rather than in an arena or a stadium. The entire idea here is that consumers have shifted over to streaming services. From an entertainment standpoint, gaming and esports are booming and the younger generations are looking for interactive entertainment. We just felt like there was a really interesting third silo, as we call it. So there's the traditional sports silo, and the esports and gaming silo. The traditional sports guys are trying to figure out how to tap into esports and gaming by adding fan engagement apps, or buying esports teams, or starting esports leagues. But we really felt there was space to put those two worlds together and really create what amounts to really a new product, which is this kind of interactive traditional sport. The format itself is different. It’s seven-on-seven football. It's centralized, so every team is in the same city. Everything is going to be played in Las Vegas. All the players live there. All the coaches will live there, so there are no travel costs. There’s shared services across the league. We don't have to replicate all of the big front offices in eight different markets. We don’t have to have a different ticket sales for teams and eight different sponsorship teams locally. Everything becomes centralized at the league level. We took a different route by creating city-based teams and influencer-based teams. Each of our eight teams will have a significant influencer as the team owner and face of the team. The first four that we have announced are Marshawn Lynch, Richard Sherman, Chad Johnson, and a huge Latin pop star named Prince Royce who has 55 million followers across social and is a big football fan. We have four more to come that we have not announced yet, but a couple of them will be big media partners and other well-known faces in sports and entertainment. So that's kind of the path that we went down. How do we create a sustainable model where you can actually spend the time to actually figure this out? If you look at the AAF, their player payrolls alone are $30 million to $40 million a season. In my mind, that is completely unsustainable. Our entire league can be run for under $15 million a year. Also, the entire game is designed and built for interactive digital fans, and everything is going to be broadcast on Twitch, with whom we have a two-year streaming deal. They're going to be heavily promoting the league and the entire experience is going to be integrated into the Twitch platform, so you can watch and call plays at the same time. Michael Moran: Can you give me a sense of how you guys make money? Farudi: You can look at our league as basically two different models put together. So first and foremost, it's a traditional sports league, with sponsorships and merchandise. A couple of years from now we think the media rights package will be incredibly valuable. But then also, this is a mobile game. Being integrated with Twitch, we have opportunities for subscription revenue and digital ad revenue on the Twitch platform. We are also as focused on the outside-of-game-day experience as we are on the game-day experience. So let's say you pick Marshawn Lynch's team. You're now locked on Marshawn’s team and now you join that leaderboard for that team. The higher you are up on that leaderboard, the more influence, more voting power, and more opportunities for unique experiences that you have for the team. So we're kind of gamifying the experience of being a fan. And then what that provides is the opportunity to create a mobile game. So fans will have the opportunity for micro-transactions and digital collectibles and digital player cards. We can monetize this as much like a mobile game as we can a traditional sports league. And then obviously down the road there are tremendous opportunities on the sports betting side. We'll be announcing a pretty significant partnership with one of the big casino operators [in Las Vegas] in the next couple months, and we've brought on someone from FanDuel who is leading our efforts on the sports betting and fantasy sports side of things as well. To me, this is about building a sticky mobile game that happens to be based on real life sports, which provides all of the drama and excitement and player interaction, and then the types of things you can do on social media and streaming on Twitch that you just can't get from a from a traditional video game. We're bringing those worlds together. Michael Moran: Are you worried at all that you're in a very difficult competitive landscape, being one among an enormous number of other leagues, including the Arena League, there's the Alliance of American Football, the Spring League, the XFL, and the AFFL? Farudi: No, not at all. The AAF had some great rule changes that I really hope the NFL actually takes a look at and implements. But at the end of the day, it's the same game, being played on the same field. The (only) problem is, the top 100 quarterbacks are in the NFL, so you get pretty terrible quarterbacks playing at this “elite level” in the AAF and XFL and that’s going to be their challenge. We are also going after a completely different demographic. Our core demographic is 18- to 34-year-olds, 86% of whom are male, gamers and Twitch users. That’s really a completely different set of eyeballs than any of the other leagues are going after. Honestly, we don't even look at them as competition. Our competition is Fortnite. Our competition is video games. We have to make sure that when we play our season, we're not competing with the Triple A titles that are being released by the game studios. What the AAF and the XFL are doing is not on our radar. 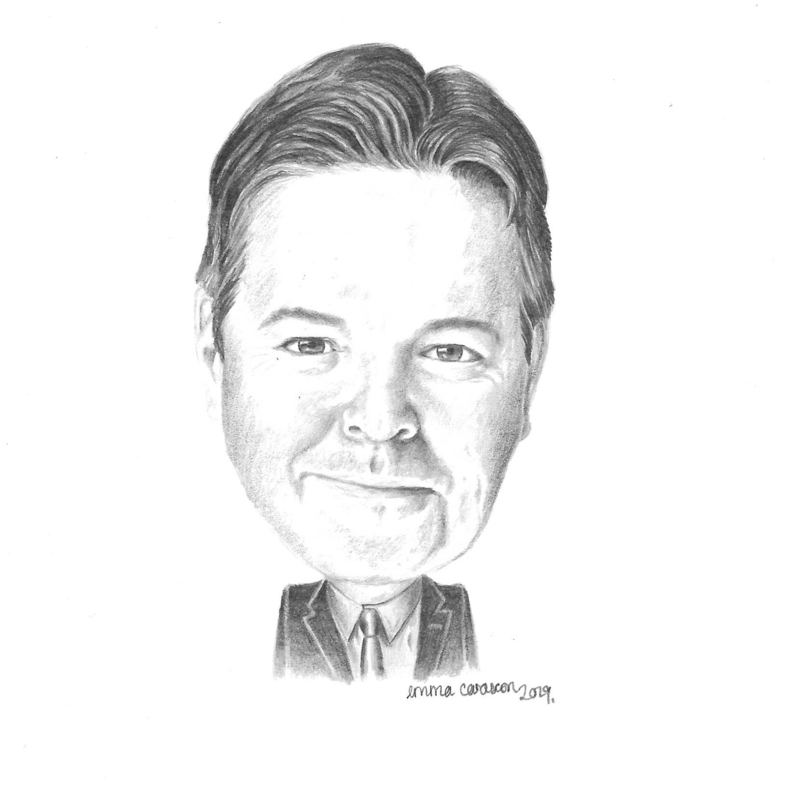 Michael Moran: Who are your investors, and what do you see as the breakeven or profitability course for you? Is it growth or investment capital? Farudi: We've got some pretty significant investors behind us, and we’ll be making a pretty big announcement in April on our Series A Round. The first three years were funded by angel investment. My co-founders and I have all started up venture-backed companies and had successful exits, so we've got a great group of people putting this together, funding it, and building the first iteration of the product. As far as how we get to profitability, we think we can be profitable by season two just because of the cost structure that we have put into place. We don't need a ton of engagement. And then from there it's about tweaking and testing out what drives people to stick around and be fans of this in the long term. The other thing that's interesting is on the brand side. Fans are going to build these brands. When you as a fan choose a team, you will get to build the brand of that team with the team owner. So if you pick Marshawn, it’s all going to be fan-submitted names. It's all going to be fan-submitted logos. Marshawn is going to pick his favorite five and then fans are going to vote on the final. You're going to end up with entities that are actually created by the fan base, so there will be the opportunity to sell merchandise and do limited-edition merchandise drops. We think this is a new paradigm in sports and we're looking at other sports that we're going to apply our platform to.